Design of Swedish Neck Pillow by Sissel was concepted by a lady named Sissel at the University Hospital in Lund, Sweden. The wave-like contoured support is intended to apply more lift under the cervical neck vertebrae, as opposed to excessively flexing the neck with too much support under the head seen with many other pillows. While lying in the supine (face up) position, this disproportionate support between neck and head functions to improve and maintain the natural lordotic neck curve, causing deep relaxation of the cervical (neck) muscles. 2) assures a nice snug fit of the shoulder against the pillow when side lying. 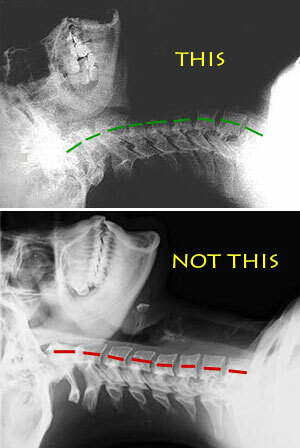 SIDE SLEEPING: the goal is to maintain proper spinal alignment while comfortably supporting the head and neck. Our medical expert advisory team recommend that users slightly angle the pillow toward their chest when sleeping on their side. This assures the head and neck be well supported for proper spinal alignment, without undesirable pressure on the jaw or TMJ. Pillow thickness really becomes important with sleeping on your side. Two instances whereby a larger thickness is desirable: (1) wide shouldered individuals; and (2) when sleeping on a very firm mattress because the shoulder is not absorbed my the mattress material, effectively raising the height of the torso relative to the head. FOAM TYPES: high quality, durable polyurethane foam in the classic version & high density, but plush visco-elastic foam in both the Sissel "soft" Pillows and the Deluxe Queen Pillow. Please note that all Sissel Pillows we offer are all designated as 'plus' or 'vario'models; meaning that they have a removeable 1 in. thick height-varying pad for pillow thickness customization. Greater thickness choice is 1 in. thicker than the standard height and better for side sleepers with wide shoulders. Please note that the standard thickness vs. the greater thickness are 4 1/3 and 5 1/2 inch respectively. This measurement pertains to the thickest part of the pillow that goes under your neck, rather than the portion where your head will rest. While side sleeping it is crucial for a pillow to occupy the space between the head and tip of the shoulder, so that your head does not tilt downhill relative to the base of your neck. Additionally, if your mattress is really firm and fails to accommodate or absorb the point of your shoulder, the greater thickness adjustment might be better. For those who exclusively sleep on their back, size is not as important, but those with breathing issues or a rounded upper back, might opt for the greater height choice in order to elevate their head a bit more. *Please note that the 'plus' designation simply means the pillow is height adjustable version. 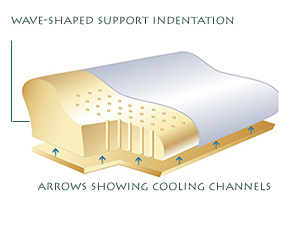 The 'soft' designation means the pillow is visco-elastic memory foam vs. polyurethane foam. The 'Deluxe' Pillow is a queen length offering both visco-elastic foam and height adjustability (so, the plus and soft qualities are both properties of the Deluxe Queen model even though those terms are not in the name. While side sleeping it is crucial for a pillow to occupy the space between the head and tip of the shoulder, so that your head does not tilt downhill relative to the base of your neck. Additionally, if your mattress is really firm and fails to accommodate or absorb the point of your shoulder, the greater thickness might be better. For those who exclusively sleep on their back, size is not as important, but those with breathing issues or a rounded upper back, and/or poor forward posture might opt for the greater height choice in order to elevate their head a bit more. Again, all Sissel Pillows we offer have a height adjustable feature. The Classic Pillow is the original polyurethane foam version and a bit firmer than visco-elastic choices. It therefore offers the greatest support available in the Sissel brand. It works great for those desiring more firmness in their pillow and was the only choice for many years. The combination of the poly foam with the “prominent wave-like neck support seen in all our Sissel Pillows, make the Classic Pillow one of the most supportive pillows that have been doctor-tested. The introduction of visco-elastic memory foams offers a 'soft' version that better relieves pressure points. The visco foam used by Sissel is high quality, durable, and fairly dense and so does offer plenty of support. However, that high degree of support is more easily tolerated due to the conforming characteristic of visco foam. This presents the likely choice if you are buying the pillow for someone else because it is more adaptable and well tolerated by most users. Visco foam is also more gentle to sensitive skin and does not tend to wrinkle the face when side sleeping. That feature alone is a big selling point for many. Visco foam is inherently better at relieving pressure points so is better for those prone to bed sores or for elderly folks with very thin skin. Both types of foam have the cooling channels built in, but overall, the poly foam offers a bit cooler temperature than visco foam. Please note that this section expresses the opinion of our own medical expert and may not be consistent with recommendation from the manufacturer. Our medical expert recommends that in order to get the most benefit from a contoured neck pillow like Sissel, that one always begin their night lying on their back for at least 10 minutes with the raised support under your neck and pillow tucked up tight against your shoulders. This facilitates improved spinal alignment and promotes neck muscle relaxation; setting the stage for full body relaxation and a better sleep experience. When turning to the side, it is best to grab the edge of the pillow in front of your face and pull it down slightly to angle the pillow toward your chest. Such action allows the support edge to follow the jawline. This ensures the head and neck is well supported without undesirable pressure on the jaw or TMJ. As a side note, angling the pillow in this manner is easier to do with standard length pillows vs. the Deluxe queen model. RETURN POLICY: For health reasons, and due to Federal Government regulations, pillows are not returnable items. There is a very high satisfaction rate with this pillow and we are hopeful you might appreciate knowing that every pillow purchased is brand new and never been tried before. PROPER USE OF A CONTOURED NECK PILLOW: our medical expert recommends that in order to get the most benefit from your contoured cervical pillow that you always begin your night on your back for at least 10 minutes with the raised support under your neck and pillow tucked up tight against your shoulders. This facilitates improved spinal alignment and coinciding neck muscle relaxation; setting the stage for full body relaxation and a better sleep experience. When turning to your side, it is best to angle the pillow toward your chest, thereby having the support edge follow the jawline. This ensures the head and neck is well supported without undesirable pressure on the jaw or TMJ. RETURN POLICY: For health reasons, and due to Federal Government regulations, pillow cases are not returnable items.